The area that is now Manhattan was long inhabited by the Lenape. In 1524, Lenape in canoes met Giovanni da Verrazzano, the first European explorer to pass New York Harbor, although he did not enter the harbor past the Narrows. It was not until the voyage of Henry Hudson, an Englishman who worked for the Dutch East India Company, that the area was mapped. Hudson came across Manhattan Island and the native people living there in 1609, and continued up the river that would later bear his name, the Hudson River, until he arrived at the site of present day Albany. A permanent European presence in New Netherland began in 1624 with the founding of a Dutch fur trading settlement on Governors Island. In 1625 construction was started on a citadel and a Fort Amsterdam on Manhattan Island, later called New Amsterdam (Nieuw Amsterdam). Manhattan Island was chosen as the site of Fort Amsterdam, a citadel for the protection of the new arrivals; its 1625 establishment is recognized as the birth date of New York City. In 1626, Peter Minuit acquired Manhattan from native people in exchange for trade goods worth sixty guilders, often mistakenly said to be worth twenty-four dollars; sixty guilders in the seventeenth century had approximately the equivalent purchasing value of one thousand dollars in modern times. Additionally, the sale was transacted with the Canarsee tribe, who did not live on or have rights on the island; the Weckquaesgeeks who lived on the island itself were not contacted or consulted about the transfer. 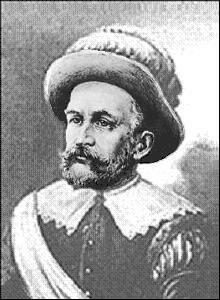 On May 4, 1626, Dutch colonist Peter Minuit arrived on the wooded island of Manhattan in present-day New York. Hired by the Dutch West India Company to oversee its trading and colonizing activities in the Hudson River region, Minuit is famous for purchasing Manhattan from resident Algonquin Indians for the equivalent of $24. The transaction was a mere formality, however, as the Dutch had already established the town of New Amsterdam at the southern end of the island. 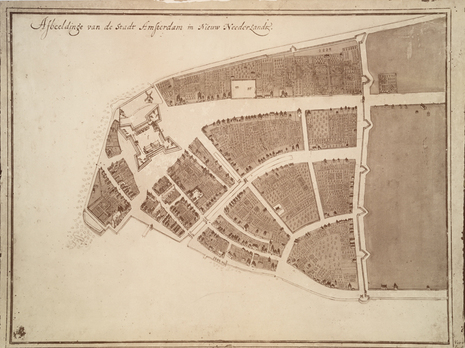 Under the direction of Minuit, New Amsterdam became the principal settlement of the Dutch West India Company's New Netherland territory. When the British seized the territory in 1664 and divided it into the colonies of New York and New Jersey, New Amsterdam was renamed New York City in honor of England's Duke of York.